Bringing awareness into the world, when you feel the odds are against you, is tough. It’s like shining the light of your soul into the darkness, only to notice that you are in shark-infested waters. How can you be the change, when you feel the majority of your peers are fine with complacency, bigotry, xenophobia, and rubbish? Of course, living with strategy in your daily lives so you feel safe is a thing. However, if you are regularly doing any of the above, don’t be surprised if you start feeling achy and sore in areas of your body, even if you may have since kissed your Crossfit membership goodbye! Because when we neglect how we feel, don’t live in the light of who we really are, and shove pain down so deeply that we successfully disconnect from the emotions around it entirely, it stays in the body, because our bodies always remember. And, it will keep giving you signals until you listen. Like that nagging pain in your lower back that you’ve been feeling ever since you’ve been under financial strain. That foot pain that started when you began to fear moving forward in life. The frontal headache that has been reoccurring whenever you neglect your intuition. Or, the sudden jaw tightness and TMJ (temporomandibular joint) pain you feel when you suppress how you really feel. When we silence our voice, we create physical imbalances in our Throat Chakra. You can read more about the Throat Chakra here. In Chinese Medicine, tension held in the jaw and TMJ pain is one of the indications of Liver Qi Stagnation (to learn more about Liver Qi, check out this article). TMJ (temporomandibular joint) pain, otherwise known as TMJ dysfunction, TMJ disorder, or simply, TMJ, occurs when there’s a dysfunction of the sliding hinge that connects your jawbone to your skull. We have one on each side of our face. Although there isn’t a clear cut reason why TMJ pain happens, some physical possibilities include arthritis, genetics, or jaw injury. Chronic teeth grinding also contributes to this; but, teeth grinding doesn’t automatically guarantee that you’ll have TMJ pain. TMJ pain can include pain in the jaw, difficulty chewing, clicking and locking of the jaw, among other symptoms. What I’ve noticed in my practice is not so much TMJ pain being inherited, but the propensity to carry tension in this area can be passed down (such as a father carrying his stress and tension in the jaw, and the daughter may also do the same). Energetically, TMJ pain may also mean that there may be a tendency to not speak up, hold resentments, or that we’re symbolically biting our tongue. Some of the typically known therapies include cortisone injection, and even surgery. But, seriously? One need not even go there. Receive an acupuncture or Reiki treatment. Usually, my recommended go-to for TMJ pain is acupuncture, because it’s one of those things we acupuncturists learn in acupuncture school that has a high success rate. That, and I get great results in my private practice! By placing needles strategically for a full body treatment (which also includes local points on the face, using gentle, Japanese facial needles), you treat the TMJ locally, but also address the stress and tension being carried in the body. It’s all about performing that yummy point protocol! And, bringing the treatment home with a little massage in the masseter and TMJ areas. However, I’ve also noticed that Reiki is an effective modality, as well, for TMJ pain, even without massage! Who would’ve thought that channeling pure Universal energy into the body through gentle touch to the chakras and other key places in the body, would ease the pain. But, that’s exactly what it does for one of my Reiki patients who experiences regular TMJ pain! The beauty of Reiki is that it goes exactly where it needs to in the body, because it is that amazing. Massage the jaw. There’s a great acupuncture point, called Stomach 7, which is on the face, located anterior to the ear, in the depression between the zygomatic arch and the mandibular notch, with the mouth closed. That’s just a fancy way of saying that this point is located where your cheekbone meets the front of your ear, in the that little notch that your finger can easily fall into. By massaging this area on both sides with your fingers for a few minutes, you start easing the tension in the area. Go a little further down on your jaw area, and you find that large muscle in the angle of your jaw, called the masseter. Pound for pound, this muscle is often considered the strongest muscle in the body. And, for those who clench their jaws a lot, and hold their stress there, it becomes very developed, holds a lot of tension, and can feel tough and tender to the touch. This is another area to massage, from the outside, using the first two fingers of both hands on both sides of the face. You can massage the inside of the masseter, as well, using you pointer finger, reaching into the mouth and massaging the tough muscle from within the mouth. It may feel funny at first, but massaging the masseter from the inside is very effective! You may also want to massage your neck muscles from the area where your ear meets your jaw, and follow down the neck to the front of your collarbone. Another good area to massage is the temporal area of the scalp, which is about two inches above the ear, on both sides. Yum! Wear a mouthguard if you’re a teeth clencher. If you clench your teeth a lot (this is called bruxism), it is likely that you may also do so at night while you sleep. Not only does this wear down your molars, and increases jaw pain, it can often give you a headache upon waking. If this sound like you, get fitted for a mouthguard, which will stop the wear and tear on your molars, and relieve the tension in your jaw and head. Find out where you need to speak your truth more, and heal old resentments. 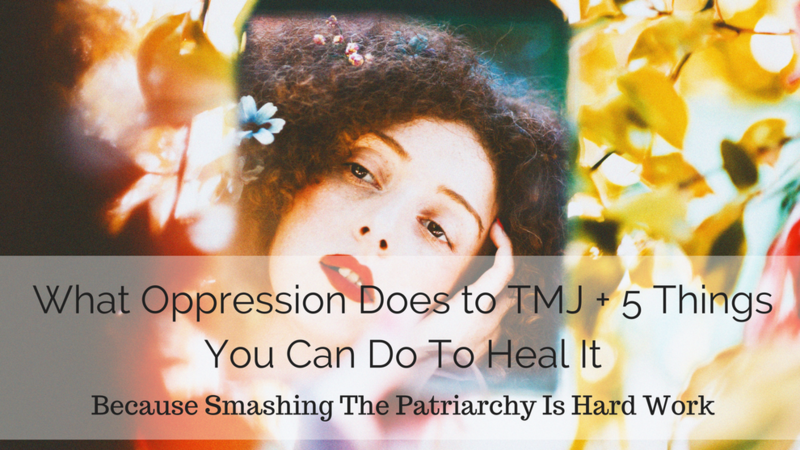 When we have TMJ pain, it energetically means that we are holding back what we really want to say, and/or holding resentment about something in our life, or towards someone. If this resonates for you at all, take a look at those times where you are monitoring what you say the most, or holding back anger. Journaling is a good tool to get our creative juices going. Find out if you’re holding back on your creative expression. Although creative expression is the realm of the Sacral Plexus Chakra, the Throat Chakra is the chakra of communications from which it is expressed. And, from personal experience performing Reiki for some time now, one imbalance in one of these chakras often involves an imbalance in the other. So, if you’re experiencing issues around other Sacral Plexus Chakra issues in your life, like your emotions, sexuality, abundance, and relationships, unpack what you’re holding there, because it is likely related to what you may not be expressing in your Throat Chakra! I’d love to hear about how you healed it in the comments, below! P.S. Did you know that you can find me on social media? Follow me on Instagram, Facebook, Twitter, and YouTube! Copyright © 2016 by Alcantara Acupuncture & Healing Arts. All rights reserved. You may quote, copy, translate and link to this article, in its entirety, on free, non-donation based websites only, as long as you include the author name and a working link back to this website. All other uses are strictly prohibited. I agree, receiving massage from a massage therapist who has had training in releasing TMJ pain, is effective!